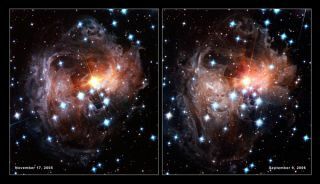 A view of "light echo" from dust illuminated by a nearby star, V838 Monocerotis, as it became 600,000 times more luminous than our sun in January 2002. The flash is believed to have been caused by a giant collision of some kind, e.g., between two stars or a star and a planet. Mysterious donut-shaped clouds of dust found near some gigantic black holes could be the cosmic remains from violent, high-speed collisions between planets and asteroids, according to a new study. An international team of astronomers studied a host of supermassive black holes, which reside in the central parts of most galaxies. They found that approximately half of them are obscured from view by strange and fat dust clouds. The details of the new study will be published in an upcoming issue of the journal Monthly Notices of the Royal Astronomical Society. The researchers' theory is inspired by the so-called zodiacal dust in our own solar system, which is known to originate from collisions between objects such as asteroids and comets. These rocky objects smash into one another at colossal speeds of more than 2 million miles per hour (over 3 million kilometers per hour), continuously shattering into fragments that eventually end up as microscopic dust, the astronomers said. This volatile environment where frequent collisions mix with intense radiation would make the planets orbiting supermassive black holes sterile, even before they are destroyed, said the study's lead author Sergei Nayakshin, of the University of Leicester in England. "Too bad for life on these planets, but on the other hand the dust created in this way blocks much of the harmful radiation from reaching the rest of the host galaxy," Nayakshin said in a statement. "This in turn may make it easier for life to prosper elsewhere in the rest of the central region of the galaxy." Understanding how these clouds of dust formed near a significant portion of black holes will play an important role in understanding how supermassive black holes grow and how they affect their host galaxies, Nayakshin added. "We suspect that the supermassive black hole in our own galaxy, the Milky Way, expelled most of the gas that would otherwise turn into more stars and planets," he said. "Understanding the origin of the dust in the inner regions of galaxies would take us one step closer to solving the mystery of the supermassive black holes."